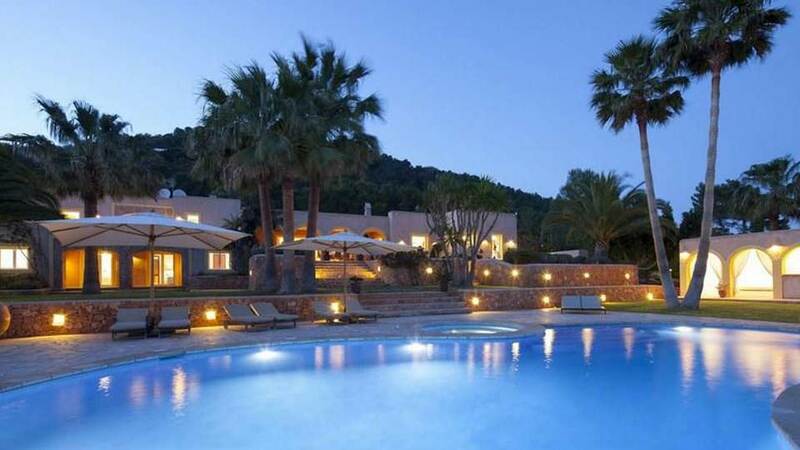 Superb property located between Porroig and Es Cubells, on a hill overlooking the entire Southwest coast and Formentera. Very nice view of the sea and the countryside. House of high quality both in terms of materials used as equipment and decoration. Plot of 15.000 M2 completely fenced largely with stone walls, very nice garden, very varied with fruit trees, pine forest, lawns and many plants. Room, Ground level, direct access to the terrace. This bedroom has 1 double bed. Bathroom ensuite, With bathtub, shower. This bedroom includes also TV, DVD player. Room, Ground level. This bedroom has 2 twin beds. Bathroom outside the room, shared. Room, Ground level. This bedroom has 1 double bed. Bathroom outside the room, shared. Room, 1st floor, direct access to the terrace, view of the sea. This bedroom has 1 double bed. Bathroom ensuite, With shower. separate WC room. This bedroom includes also fireplace, TV, safe. Room, Terrace level. This bedroom has 2 twin beds. Bathroom outside the room, shared, With shower. Room, Terrace level. This bedroom has 1 double bed. Bathroom outside the room, shared, With shower. Room, Terrace level. This bedroom has 2 twin beds. Bathroom outside the room, With shower. Main entrance by a closed patio giving access to a hall with guest cloakroom. Indoor dining room and outdoor porch. Reserve with washing machine and dryer. Large living room with fireplace, billiard table and office area. Stereo, satellite TV with international and French channels, DVD player, telephone and fax. Kitchen with electric hob and fridge. 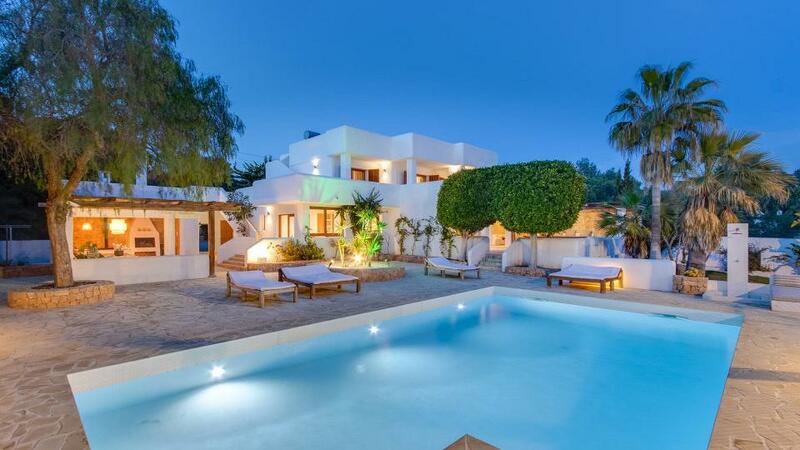 Large porch terrace with outdoor lounge and dining area overlooking the pool. 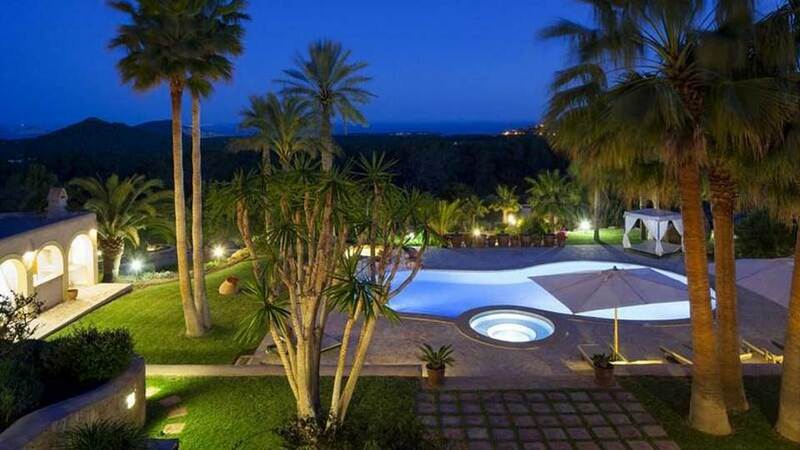 Irregular shaped pool, heated, with jacuzzi and small natural pool, surrounded by terraces and lawns. 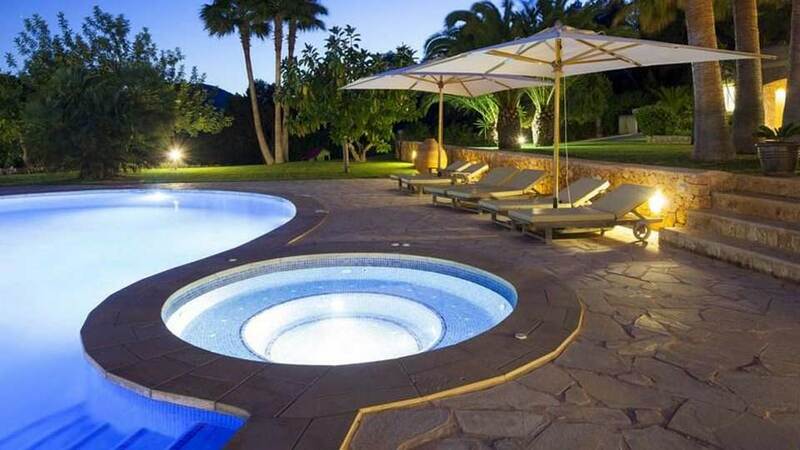 Pool house with barbecue, small kitchen with fridge, bathroom with shower and corner for massages. Very varied garden with fruit trees, pine forest, lawns and many plants. 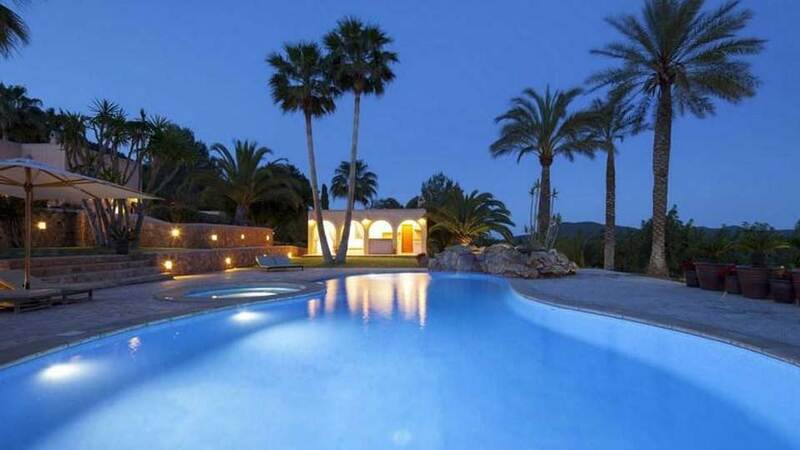 10 minutes from Ibiza town and San José. 12 km from our local offices in Cala Tarida.